In an effort to collaborate with the American Nurses Association Nurses Week 2016 events, we are happy to share patient safety resources with you this week. Take some time to check out our other Culture of Safety resources and download our full toolkit for use in the weeks to come! Improving patient safety is of critical importance in today’s healthcare industry. Patient injury or illness due to the error of a healthcare professional is unacceptable and should be avoided. Healthcare workers must seek diligently to improve patient safety by streamlining procedures, paying careful attention to details at all times and thinking with a clear and sharp mind even during the most stressful situations. Remembering that patient safety is a systemic concern in healthcare, there are specific things that nurses can do to improve patient safety dramatically, on both an individual and industry wide basis. 1. Always maintain hand hygiene compliance. Research shows a strong link between unclean hands, poor hand washing habits and the transmission of health care associated infections (HCAIs). Hand washing rates are lower than they should be, with an estimate of 40% of necessary hand washing actually taking place when it should. Effective hand washing practices are critically necessary and must be observed at all times. 2. Use the appropriate barriers and personal protective equipment to stop the spread of germs. According to the CDC, over 1.7 million health care associated infections occur in the U.S. each year. With the appropriate disposable gear, such as gowns, masks, and gloves, this number could be dramatically reduced. Implementing and adhering to infection control procedures, instituting barrier precautions and maintaining sterility when needed are some of the most important measures nurses can take within healthcare institutions. Using sharps precautions and personal protective equipment (PPE) when dealing with infectious agents are essential ways of keeping yourself safe from infection in the workplace. 3. Using care bundles can help to prevent central line-associated blood infections and other HCAIs. The diligent use of barrier precautions can dramatically reduce the number of central line infections. When inserting venous catheters, health care workers should always wear gloves, masks, sterile gowns and full body drapes whenever possible. In addition to the care bundles, good practice calls for proper hand washing protocol as well as cleaning the skin of the patient with chlorhexidine. There should be systems-based approach to the procedure of inserting venous catheters as well. Automated reminder systems can also help to reduce the number of infections. CVC removal and dressing changes can be automatically incorporated into most care plans. This is also the case with preventing ventilator acquired pneumonia (VAP), as automatic reminders of when to perform oral cares and suctioning as well as reminders of head of bed levels have been found to reduce infections in patients. Care bundles allow you focus on all aspects of a safe and error free procedure as well as the nursing interventions that accompany caring for patient requiring certain medical procedures and interventions. 4. The use of procedural checklists can dramatically help nurses to insure patient safety. For example, preoperative checklists not only standardize procedures across patients but give nurses a simple step by step reminder of what needs to be done, helping to eliminate errors because of a lapse in memory. Patient checklists help members across teams to double check important details such as identity, surgical site, type of procedure and other important details. 5. Be specific when dealing with medications and pay attention to the “Five Rights” of med administration. Each time medication of any kind is administered, ask is it the “Right Medication, Right Dose, Right Time, Right Route, Right Patient.” Also, avoid abbreviating the names of medications. Approximately 15,000 medication errors per year are correlated with the use of dangerous abbreviations. “U” for “unit” for example, could mean a variety of things. These kinds of abbreviations are not standardized. Many common abbreviations could seriously jeopardize the safety of medication administration. Also, reconcile medications during transition times and eliminate conversation from Pyxis counts and when hanging IVs to minimize distraction related errors. 6. Use a wide variety of treatment interventions to prevent pressure ulcers, or bedsores. For those patients who are bedridden due to injury or illness, spending long periods of time in one spot can result in painful sores that further put patients at risk for infections. Estimates note close to 2.5 million patients per year who develop bedsores during a hospital stay. 7. Develop a standard procedure for assisting patients in the reduction of falls while in the hospital. The use of simple procedures such as bed rails or the avoidance of wet areas in and around the patient’s area of care can help to insure the patient’s safety from falling and becoming further injured. Regular rounding to assess your patients’ need for using the restroom or repositioning are also essential to preventing falls. A good standard to follow is to make sure you visit your patient’s room at least hourly, to ensure that they are safe. Too hard, you say? Too busy? Use your assistive personnel and your coworkers if you are in a procedure or can’t round on your patients at least every two hours. Meeting your patients’ needs is the best fall prevention strategy there is. 8. Use simulation exercises to enhance medical and patient safety training while sparing patients from risk. Playing through possible scenarios can eliminate guesswork during a time of real crisis. When teams work together to examine possible situations and develop plans, then when the real thing might occur, the healthcare team is more prepared and less likely to make errors. 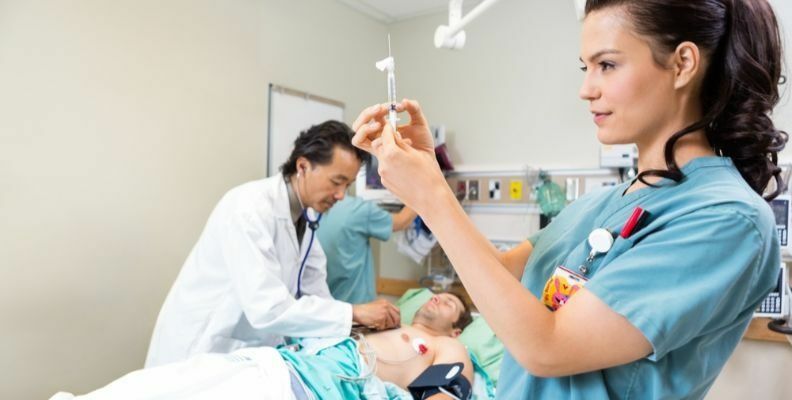 Simulation labs are increasingly being used in nursing schools and during clinicals, allowing you to play out emergency and acute events without compromising patient safety. Take advantage of these lessons, as they are much safer to learn on a simulator than in real life. Once you’ve played through a Code Blue scenario ten times in sim lab, you can bet you will be able to react more effectively and efficiently when you have to pull that alarm for the first time in a patient’s room. 9. Get plenty of rest as well as proper diet to insure that your own health remains intact. A sick nurse isn’t going to be much help to a sick patient. Nurses work hard, long hours and the stress can take a toll, both mentally and physically. Staying well rested can sound like a joke, especially if you work nights, but it is anything but funny. Sleep deprivation can mimic the effects of drinking alcohol, impairing both your cognitive abilities and reaction time which can be a fatal combination for patients. Even if you are not able to sleep a full ten hours like you may have before starting nursing school, there are ways to ensure you get the rest you need. You can nap regularly and provide yourself with regular meals and exercise. Meditation is also a great tool for nurses, as it can enhance focus, attention and awareness – three crucial tools for a mindful nurse. Taking care of yourself is essential and though nurses are notoriously poor at self-care, the old adage is true: You can’t be good for anyone else if you’re not good to yourself first. 10. When possible, eliminate the human error factor with the use of technology. While computer programs are by no means fail safe, the consistency and mechanics of technology allow for an environment that can reduce mistakes that are often the result of human error. Muli-tasking healthcare workers who are working in stressful environments shift after shift are bound to forget to label a central line dressing eventually. With computerized charting that automatically flags dressing changes based on placement dates and documentation, simple errors that can lead to severe consequences can be reduced. Though technology has expanded in healthcare, there will never be any machine that can replace a nurse, so don’t be worried by all the bells and whistles – use them to your advantage! Mistakes happen. Nurses are humans, too, though we often pretend we’re not. In a culture of safety, taking preventative measures can not only improve patient health, but can protect you and those you are caring for from critical errors. As a nurse whose been there, trust me: It takes a lot more time and energy to fill out an incident report about a patient fall than it does to peak your head into someone’s room and ask if they need to use the bedpan. We all learn from our mistakes, but there are some mistakes you can prevent in the first place. Take your time, be alert, use your protocols and share these tips for patient safety with your unit this week. Spread the knowledge, because an educated nurse is the most powerful player on a healthcare team!